The girls of Westwood High School beat Dover-Sherborn 57-24 last Monday afternoon, putting on a dazzling display of passing, cutting and forcing turnovers so well executed that you would have thought they were from Westwood, Los Angeles, not Westwood, Massachusetts. 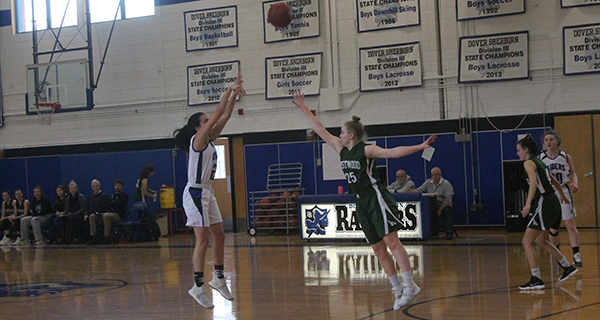 Like the famed UCLA teams of the seventies, the Westwood High girls were just too good for their opponent, the Dover-Sherborn Raiders - not that the Raiders did themselves any favors. 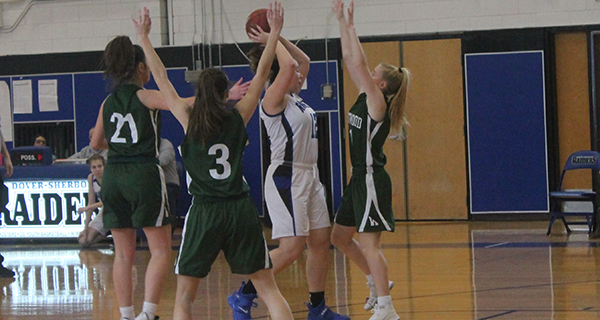 Trailing 29-13 at the half, a rough third quarter doomed Dover-Sherborn, who consistently struggled to get back on defense and at one point gave up back-to-back layups off of turnovers. A 20-7 third quarter run ensued, essentially dooming any comeback chances the Raiders had. Head coach Kanee Chlebda acknowledged that the team came out flat in the third, but also had to acknowledge that at the end of the day, Westwood is just really good. The win moved Westwood to 8-1, while Dover-Sherborn dropped to 5-7. Still, Chlebda saw some positives in the loss, and things her team could build upon. So, Dover-Sherborn will go back to the drawing board to work on some things, while Westwood will look to continue improving what is already a solid team and see what kinds of wizardry head coach Katherine Clifford can conjure up next.